Very rarely do we see a story about a kid who loves the cold, snowy North. 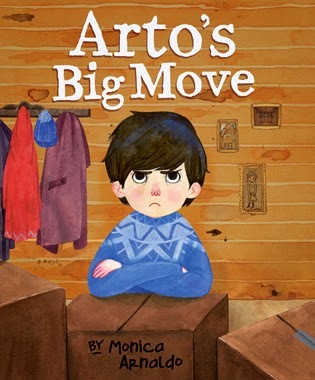 So, Monica Arnaldo’s book Arto’s Big Move is a refreshing read. The story about a boy called Arto, who has lived his whole life in the North (yeah, six years is a long time), and now gets the news that he has to move to the warm South. Who wants to really want to move to the south where the sun is hot and sweltering, and strange birds are a flutter? The premise itself is interesting. Grumpy Arto stubbornly refuses to let go of his love for the North, by continuing to wear his big red coat, boots, mittens and hat in the heat of the South. Until, he makes a new friend Ana. Arto realizes the importance of change and starts to appreciate the good things that come when learn to adapt to life. Monica Arnaldo has written a beautiful book that teaches kids a wonderful lesson.